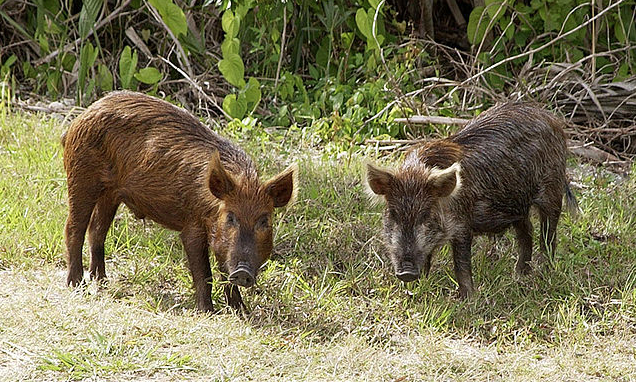 Officials in Denmark are building a $12 million wall on the border of Denmark and Germany to help prevent invasive feral pigs from entering the country. Boar hunting in Germany and Europe has roots dating back centuries, with literary works and art providing a chronicle of hunters and hairy tusked beasts in the throes of battle. Denmark doesn't want any part of it now, though. While history is cool, having invasive feral hogs crossing its southern border from Germany is not. The southern border is fairly open, with private landowners' farms and agriculture tracts that allow the pigs to move easily from one country to the other. Denmark's tired of that and began building a $12 million border wall in late January 2019. Part of the reason is to protect landowners from more feral pigs, but foremost is to help prevent African swine fever from entering the country. Denmark has not detected ASF in its domestic swine population; the disease was found in Belgium in September 2018. Denmark's border wall won't be an actual wall but instead will be an electrified steel fence about 5 feet tall and 40 miles long. Officials say small animals should be able to get through the wall in gaps, but larger ones such as feral pigs will find themselves with a not-so-friendly greeting. Sections of the fence were to be erected starting at Padborg on the eastern border and be put up west toward the Atlantic coast throughout 2019. The first sections will be examined and modified if necessary for effectiveness before the remaining sections are constructed. “We have 11 billion good reasons to do everything we can to prevent African swine fever reaching Denmark. And now we can finally get started on erecting our wild boar fence. The fence and our increased efforts to hunt wild boar will break the chain of infection so there is less risk of African swine fever spreading to Denmark,” said Jakob Ellemann-Jensen, Minister for Environment and Food. Along with the fence, hunters may pursue wild boar around the clock and greater efforts have been made to hunt boar on state and private lands. National Public Radio reported that Denmark has about 12 million pigs and 6 million residents, and the country makes about $5 billion a year in pork exports. The wild boar fence will be a strong steel-mat fence, 1.5 metres high and extending 50 cm underground. On stretches along border waterways and trenches, the height of the fence can be reduced to achieve a moat-like effect in front of the fence. There will be permanent openings in the fence at Schengen border crossing points and areas where waterways intersect. In total, there will be 20 permanent openings for waterways and Schengen border crossing points along the 70-kilometre fence. The fence will include gates and cattle grids at other crossing points along the border. There will be at least one gate per kilometer. Steps will be placed between the gates, so it will be possible to climb over the fence. There will be a 20x20 cm opening every 100 metres to allow smaller animals to pass through the fence.